Spring in Butler County | Visit Butler County Pennsylvania! Spring is the a perfect time to delight in the freshness of the season and partake in some outdoor recreation. Try biking, hiking or wildlife watching. Want something new and different? Try your hand at disc golf or go geocaching. If you’d prefer, grab some loved ones and just enjoy a relaxing picnic. Spring is wonderful for snapping colorful pictures of nature. While Mother Nature turns everything green, it’s a great time to pay a visit! We’ve got plenty of campgrounds for you to choose from. Whether you prefer roughing it, or you think a cabin with full amenities is rough, there is something here for you. Get the whole gang together and create a weekend full of family memories. Tell ghost stories, chow down on mountain pies and absorb some perfect weather. Did you know George Washington traveled through this area? You can follow his path, now labeled as Washington’s Trail. Feel like a superhero by moving a one ton revolving stone gate in Harmony. Discover the German history of many of our small towns. There’s plenty of history to “dig up” in Butler County. March 2: The Butler County Symphony Orchestra presents “Safety Last” a Silent Film with Orchestra. March 23: Maple Madness at Succop Nature Park. May 4: Zelienople Historical Society Garden Talk. It’s pretty hard not to love flowers, right? The beautiful colors and scents… the endless varieties… the way they just seem to magically appear after a long winter. Here in western Pennsylvania, there are plentiful opportunities to admire wildflowers and even make your own home blossom. Several upcoming events will help you get in tune with your inner gardener, whether you’re an amateur or have a seasoned green thumb. On May 11th, Glade Run is offering their 20th annual Spring Gardening Symposium. Held in Zelienople, all proceeds will benefit Therapeutic Programs at Glade Run Adventures which utilize plants, animals and the natural environment to assist in the treatment of children with emotional and behavioral challenges. Registration is required. 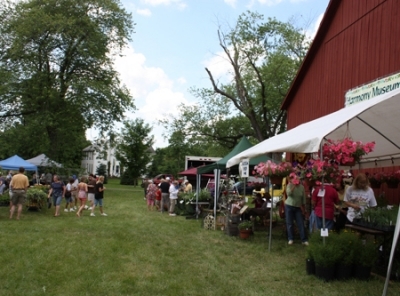 May 18th is a Spring Garden Market and Home Show at Alameda Park in Butler. A showcase of exhibitors will help you to welcome spring with landscaping materials and live plants for sale. The event is family-friendly, also offering free childrens’ activities and live entertainment. 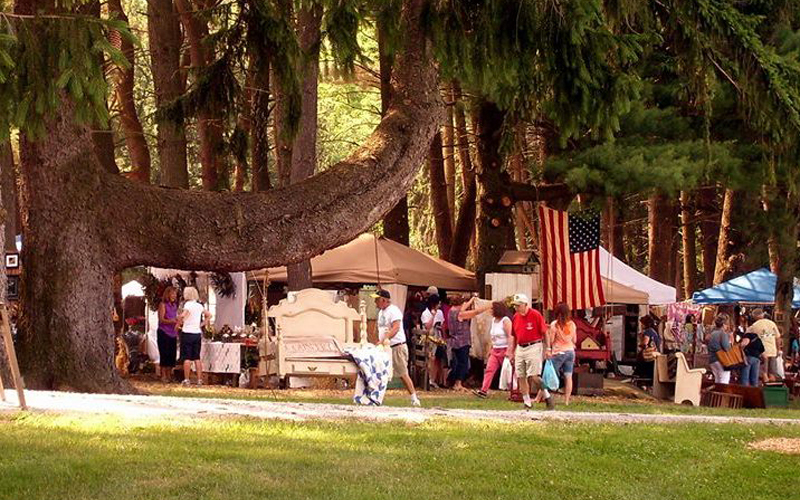 The town of Harmony will come together on June 8th for the Herb & Garden Show & Fair. The event includes vendors, a plant exchange, vegetables, herbs, roses and ornamentals for sale, plus expert advice. In addition, there will be art demonstrations, live music, museum tours antiques and much more! Open year-round, Quality Gardens, located on Route 228, includes 32,000 square feet of greenhouse space, 20,000 square feet of outdoor nursery space, a one-of-a-kind 5,000 square foot glass garden center, 2 ½ acres of chrysanthemum production, as well as farm market and landscape services divisions. Basically anything you need to care for your plants and yard can be found there! Local farmers’ markets are also an excellent source to find plants and starter vegetables/herbs. We’re lucky to have farmers who work hard all year round, not only as growers, but as businessmen, allowing us to benefit from their local product. Perhaps some of the best plants are ones you don’t have to care for… the ones Mother Nature nurtures for us to simply enjoy. Spring wildflowers typically bloom mid-April through mid-to-late May, and right here in Butler County, we are graced with some amazing spots to relish their beauty. 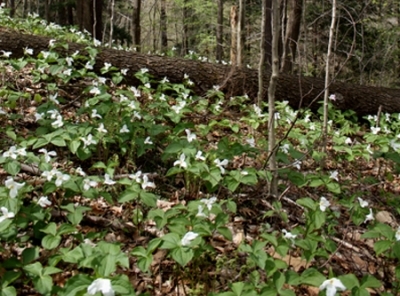 Wolf Creek Narrows in Slippery Rock (located on West Water Street) is known for its spectacular display of white trillium, a three-petalled flower belonging to the lily family. This natural area has an active floodplain, a mature northern hardwood forest and picturesque cliffs. A 1.5-mile loop trail provides a scenic tour of the park. Other wildflowers you might encounter include violets, blue bells and the rare white fawn lily. Another great spot for viewing spring wildflowers is Jennings Environmental Education Center. Two woodland trails are recommended. The Black Cherry Trail is a half-mile loop that follows Big Run, which is ironically a small stream. The Hepatica Trail is a quarter-mile trail which connects the Oakwoods Trail to Glacier Ridge Trail. Hepatica are often-purple flowers from the buttercup family. Trillium can be seen at Jennings as well. Thus concludes my information on gardening and wildflowers, so get out your mudding shoes and take a hike or plant some greens!